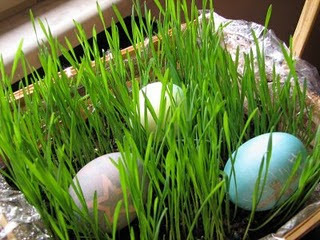 Celebrating Easter ~ Share your pictures and recipes! Charlotte and I are putting together a series of weekly menu's for celebrating the 50 days of Easter. 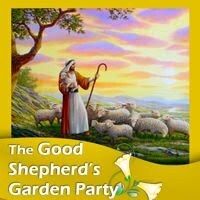 We will be posting a Mr. Linky here at Catholic Cuisine for any of you who would like to share photos from your own* Good Shepherd's Garden Parties. *Please feel free to modify our plans to suit your family! O Divine Saviour, who rose from the dead on that first glorious Easter morn, grant that I may rise from my sins and so live as to see You, glorious and immortal, in heaven. 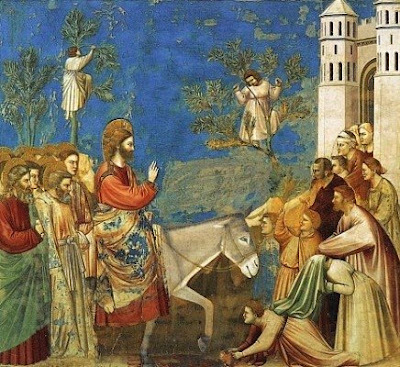 Lord, I am nothing, but, although nothing, I adore You. 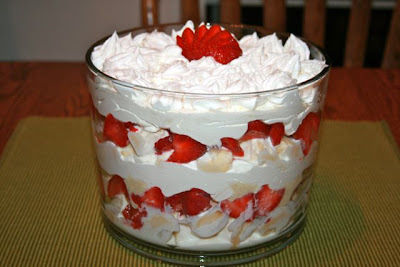 I've had a number of requests for the recipe for the Strawberry Trifle we made for the feast of St. Joseph. There really wasn't any particular significance to why we included it on our St. Joseph Altar, other than the fact that my girls were finishing up "S" week and it was a great way to use some Sliced Strawberries! 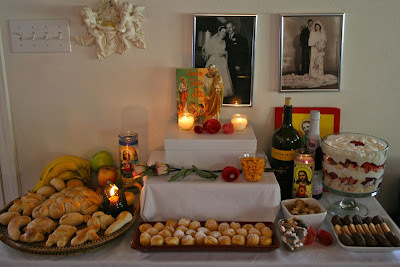 It would be a great addition to upcoming Easter celebrations, and since it is based on the flavors in a popular Mexican cake, it would be great dessert to make in honor of any of the Mexican Saints. 1. Set aside one strawberry for garnish. Hull remaining strawberries and slice. Set aside. 2. Trim Pound cake and dice into 1-in. cubes. Set aside. Whisk together 1/2 cup of the condensed milk, 2/3 cup of the coconut milk and sour cream. Add cake and toss gently. 3. Attach open star tip to Pampered Chef's Easy Accent® Decorator. Fill with 1 cup of the whipped topping. Combine pudding mix and remaining coconut milk; whisk until thickened. Add remaining condensed milk and cinnamon; whisk until incorporated. 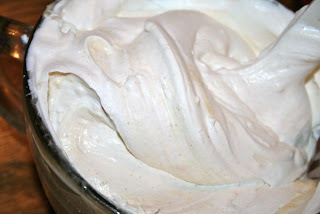 Fold in remaining whipped topping. 4. 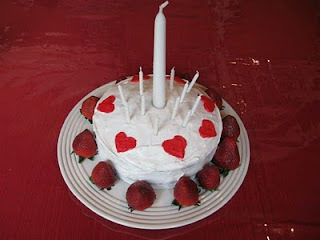 To assemble, place half of the pound cake mixture into Trifle Bowl; top with half of the strawberries. 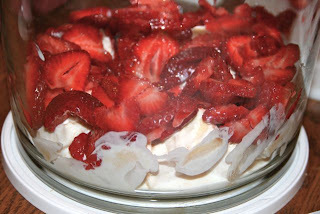 Spread half of the pudding mixture over strawberries. Repeat layers one time. Pipe whipped topping over top; garnish with strawberry fan. Last month I was blessed with being the very thankful recipient of a whole bunch of dinners made by a local Little Flower Girl's Club as a service project! One of the dinners was this lentil soup, which was very delicious. 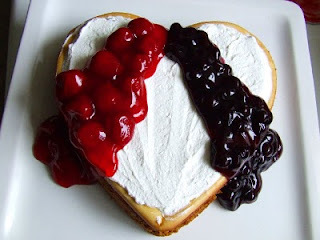 I was able to get the recipe from my friend Kathleen so I could make it again, and then share the recipe here at Catholic Cuisine. Enjoy! Rinse the lentils. Bring them to a boil in the salted stock. Reduce the heat and simmer, covered, for 40 minutes. Meanwhile, heat the olive oil in a heavy soup pot. Saute the onions until translucent. Add the garlic, cayenne , bay leaves, and raw bulghur. Stir the mixture on medium heat until the onions and bulghur are lightly browned. Pour the lentils and their liquid into the soup pot with the onions and bulghur. Simmer the soup for 15 minutes. Add the rosemary, salt, and pepper to taste. 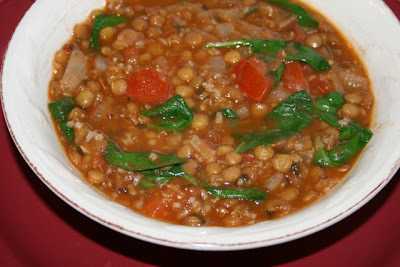 If the lentils and bulghur have absorbed too much liquid, add more stock, water, or tomato juice. Remove the bay leaves. 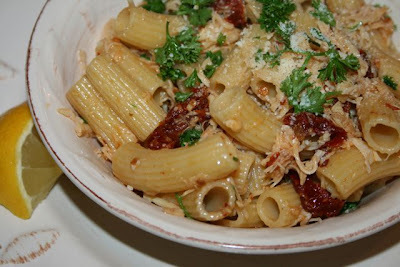 Here is another recipe I served my family a couple weeks ago. It was quite easy to make and enjoyed by everyone. The recipe serves 4, so I doubled it for my family. 1. Bring salted water to a boil and cook pasta according to package directions; drain. 2. Meanwhile, grate cheese. Pat tomatoes dry using paper towels. Chop tomatoes and parsley. Cut lemon into wedges; set aside. 3. Heat oil, pressed garlic and pepper flakes in skillet over medium-high heat 1-2 minutes or until garlic turns golden (do not allow to burn). Immediately stir in tuna and tomatoes; cook 2-3 minutes or until tomatoes are tender. Add pasta, half of the parsley and half of the cheese to Skillet; toss gently. This recipe for Salmon Chowder, perfect for the remaining days of Lenten Fasting and Abstinence, was submitted by my friend Jacinta. Thank you Jacinta! 1. Drain and flake salmon, reserving liquid. 2. Saute onions, celery and garlic in butter. Add potatoes, carrots, reserved salmon liquid, chicken broth and seasonings. Simmer, covered, 20 minutes, or until vegetables are nearly tender. 3. Add broccoli and cook 5 minutes. Add flaked salmon, evaporated milk and corn; heat thoroughly. Sprinkle with minced parsley to serve. Note: I like to chop all the vegetables (except the corn) with the Pampered Chef chopper so they are all small and uniform. 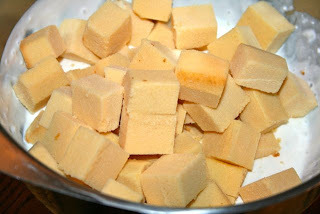 ♣ Place candy pieces and place into the freezer for 15 minutes. ♣ Blend milk and spinach until smooth. 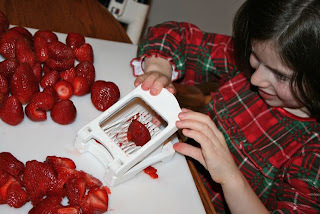 ♣ Add vanilla ice cream and candy and blend on medium speed for 30 seconds. Stir with a spoon and blend for 30 more seconds. ♣ Repeat until desired consistency is reached. ♣ Top with whipped cream. I hope you all have a very Happy St. Patrick's Day! 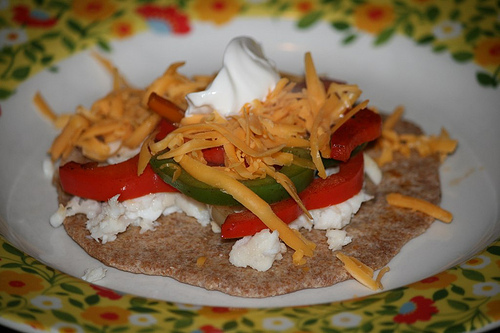 One of our new favorite Lenten meals is Fish Fajitas. Thought I would share this with you. The recipe is not very exact because it really depends on how many people you are feeding. I just got the packaged tilapia from Costco and cooked it according to package directions except lightly sprinkling equal amounts of wine and lemon juice. For about 6 fish filets I used probably 1/8 a cup of each. Sprinkle with salt and pepper. Meanwhile slice peppers and onions thinly and fry in a little bit of oil. When fish is done, flake it up. 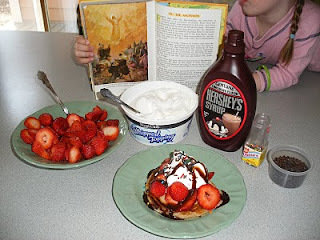 It is all pretty easy and very yummy! Even my little ones will eat it! Ok, ok... they do pull off the peppers and onions, but they eat the fish! Update: I forgot to add (thank you PNG for reminding me) that this is so simple to add your favorite spices too. My kids like it mild, so i didn't add anything special other than the ones listed above. Also I would have had salsa on they too, but we were out! This recipe for baked beans, a traditional Irish side dish, was submitted by Janet, from ADD Honey Bee. Thank you Janet! The kids love these beans. They have molasses and brown sugar in them which is probably why. We've renamed Boston Baked Beans, St. Patrick's Beans, my recipe varies a bit from the original to eliminate food allergens. It is vegetarian, nightshade free, casein and gluten free. We serve this with boiled cabbage and turnips. I've also made Irish Soda bread, but the kids can't have it and us not having it is a sacrifice. I use a Crock Pot and don't soak the beans. I was one of those folks who used to get fussy about non-Irish celebrating a wonderful saint by partying until they puked, but now I'm happy to sign a petition to make St. Patrick's Day a national holiday, even if it is sponsored by a beer company. Wouldn't it be wonderful if a Catholic Saint was honored with a national holiday? I think of a wonderful opportunity to evangelize Christians and non-Christians world wide about this wonderful Catholic, not just Christian, saint. Rinse and pick the stones out of the beans, put in a crock pot with the chopped onion, molasses, brown sugar and dry mustard. DO NOT ADD THE SALT. Cover with water and cook on high for 4-6 hours. Avoid taking the lid off the pot or stirring too much. If you need to add more water, make sure it is boiling hot. When the beans are tender, add the salt and pepper and serve. 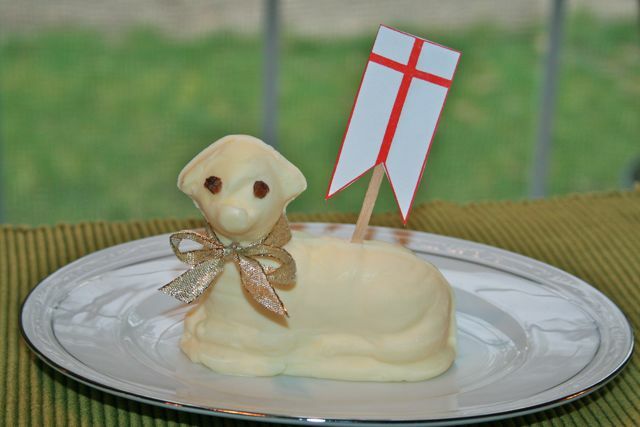 This food/craft recipe was submitted by Victoria, from Designer Pastry, for publication here at Catholic Cuisine. I think it is such a cute idea! 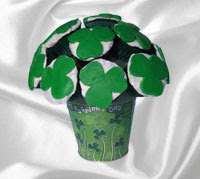 Victoria made the Shamrocks on her cupcake bouquet with Fondant, but they could be made many different ways. Thank you Victoria! Here is a picture of one of the Cupcake Bouquets our family bakery, Designer Pastry, put together for Saint Patrick's Feast Day. We used a small festive container, found at Michaels, and topped it with a green foam ball that we cut to size and attached gourmet cupcakes that we arranged like you would for a floral arrangement. On this cupcake bouquet, we made Mint Filled Brownie Cupcakes. You can use any brownie batter, but I suggest making one with Dutch processed Cocoa, which has a much richer flavor than the typical Hershey's Cocoa. Then, after pouring about 1 heaping tablespoon of the brownie batter into standard muffin cups, place in one peppermint patty (York will do just fine) and then cover with additional brownie batter. After cooling cupcakes on a cooling racking, ice them with white buttercream frosting. 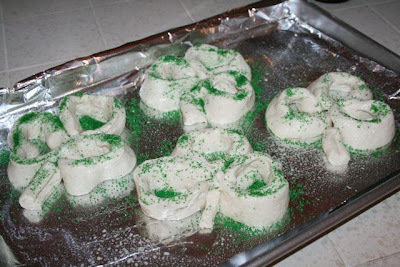 Use green gel paste color to tint fondant and use a shamrock cookie cutter to cut out shamrocks to be set upon the white buttercream. We cut off the shamrock stem to make it look a little more like a shamrock bouquet. Do any of you happen to have the St. Nicholas Cookie Cutters? I purchased a set last year and wanted to take a second to point out how well they work for various other feast days as well! 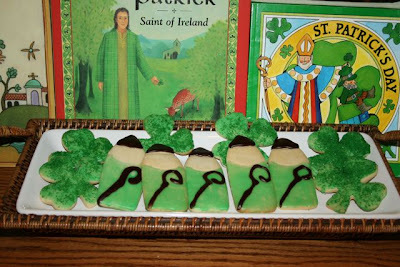 For the St. Patrick Cookies pictured above, we used our favorite sugar cookie recipe, the "Small Nick" cookie cutter (as well as Wilton's Shamrock), painted them with a thin green icing (plus sprinkles on the shamrocks), and piped on chocolate decorating icing for his miter and staff. Didn't they turn out cute?! Basically the St. Nicholas cookie cutters could be used to represent any Pope or Bishop! 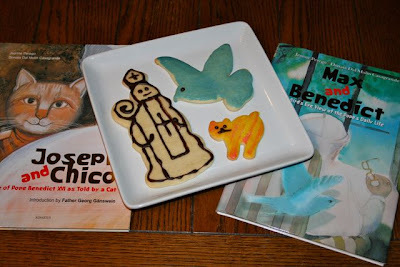 Using the same recipe linked above we have also made cookies, in honor of Pope Benedict XVI, using the "Austrian I" cookie cutter, a Dove/Bird Cookie Cutter, and a cat cookie cutter to go along with the great picture books: Joseph and Chico: The Life of Pope Benedict XVI as Told By a Cat and Max and Benedict: A Bird's Eye View of the Pope's Daily Life . These would be great to make on his birthday, which is coming up next month on April 16th. 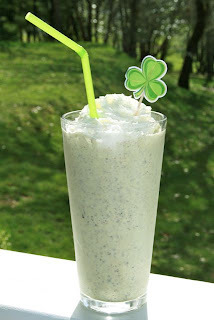 Here is another fun and easy shamrock snack, inspired by Family Fun, for St. Patrick's Day. We recently made these during "P" week and plan to make them again on the 17th! Line a cookie sheet with aluminum foil and lightly coat it with cooking spray. 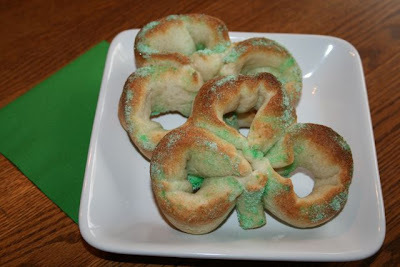 This recipe is from originally from Family Fun and would be a fun snack to serve on March 17th, the Feast of St. Patrick. 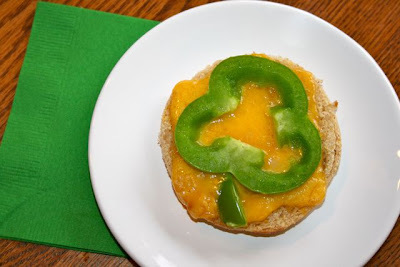 To make one, slice a green pepper crosswise near the pointed end to get a small, three-lobed shamrock shape. (If your pepper has four lobes, you've got a lucky clover instead.) Cut a small slice for a stem. 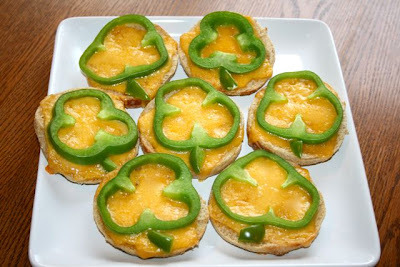 Toast half an English muffin, then top it with a slice of Cheddar and the pepper shamrock. Place the muffin on a tray, then broil it in a toaster oven until the cheese is melted.